“Our society thinks that daughters are only for reproduction, for taking care of the children at home and for looking after the household. 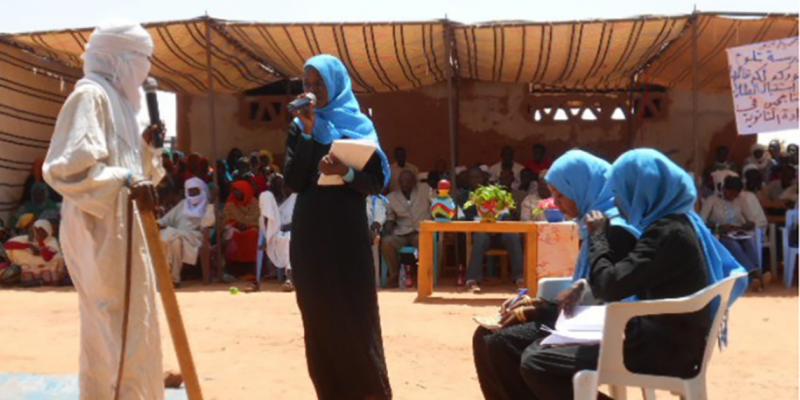 This view demotes women, their image and their role in society” says Nafisa, a librarian at the Jesuit Refugee Service Youth Center in Amnabak Refugee Camp. A major obstacle to education for girls in Chad is forced or early marriage. There are still many girls who undergo this cultural practice in refugee camps, as in many African societies. Child marriage poses many risks to the healthy development of girls. Often, this practice means that girls educations are cut short. In this class alone, five girls were victims of early marriage. Students are suddenly taken out of class and married off, generally to older men, by their parents. Some had to give up school two or three months before they were scheduled to graduate. In the Toulom and Am Nabak refugee camps in eastern Chad, JRS is working to prevent child marriage and increase access to education for girls. During the 2015-2016 school year, there was some marked achievements in JRS secondary schools: an increased attendance rate, and the highest success rate in the Chadian National Exams at 70 percent. Of the 31 candidates who sat for the exam, 21 passed: two boys and 19 girls. Our society thinks that daughters are only for reproduction, for taking care of the children at home and for looking after the household. This view demotes women, their image and their role in society. JRS also encourages informal education and the arts to combat social issues. Touched by this tragedy, the graduates of JRS’ high school in the Touloum camp, chose to create and perform a play before the entire community called Drilled Marriage. The graduates chose this title to emphasize the damage of forced and child marriage and to raise awareness of the issue in their community.